After a delay of around 15 months BW has finally coughed up some information about changes to its “continuous cruising” enforcement procedure. 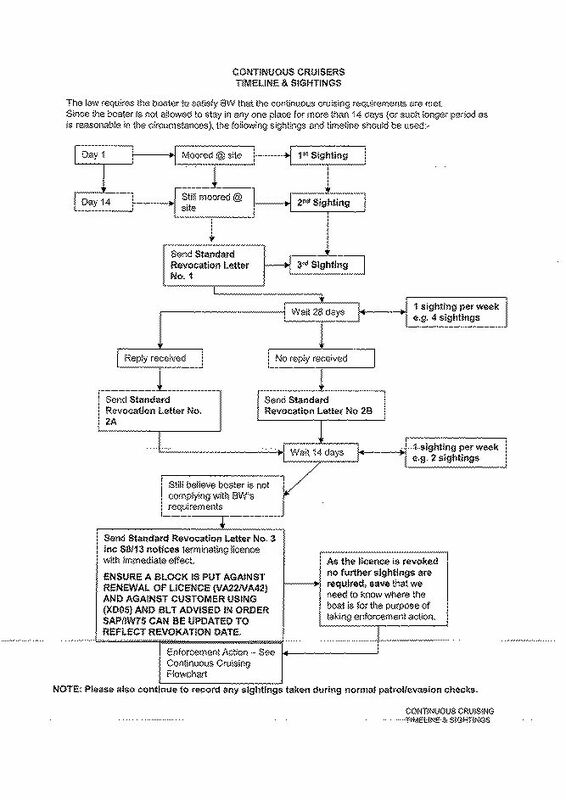 A Freedom of Information request was made in October 2010 after changes to the procedure were mentioned in a BW briefing for User Group meetings. The FOI request was refused; in June 2011 the boater referred the matter to the Information Commissioner after BW failed to respond to a request for a review of its refusal to provide the information. Below are the new Continuous Cruising Flowchart and Continuous Cruising Timeline. (The original FOI request is at the end of this article.) 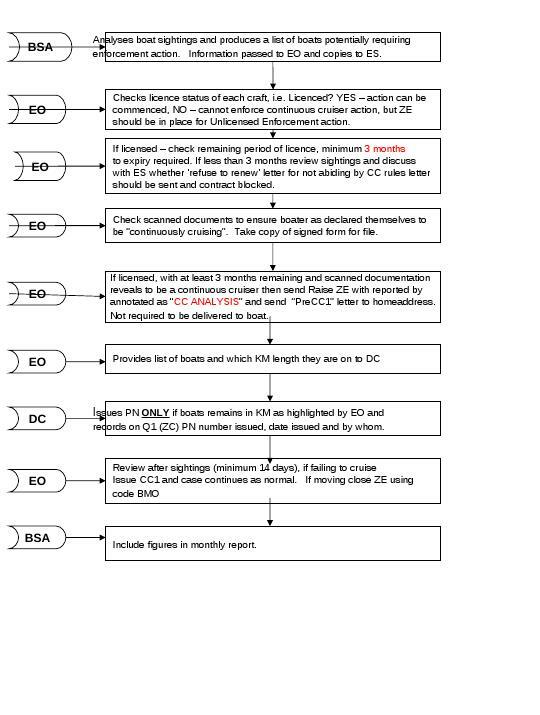 The main changes are the inclusion of the “Pre-CC1” letter and the blocking of any attempt to relicense a boat that has had its licence revoked. The other issue of note is that boat sightings over a period of 9 months are being used to judge whether or not a boater is complying with Section 17 3 c ii of the 1995 British Waterways Act. This is contrary to what Parliament intended – according to the evidence BW submitted to the Commons Select Committee that drafted the 1995 Act, boat movements were to be looked at when the licence was due for renewal, not 3 months before that date. Yet another aspect of the “Continuous Cruising” Procedure that is unlawful. The entire enforcement procedure is based on whether a boat’s movements comply with the Guidance for Boaters Without a Home Mooring, which sets movement requirements that are beyond what is specified in section 17 3 c ii. The Information Commissioner decided that BW did not have to provide all the information requested. Below is the original FOI request, the Information Commissioner’s decision and the explanation that BW was ordered to provide. BW’s explanation contains several exaggerations of its legal powers, so read it with a large pinch of salt. 2. all briefings, procedural guidance and instructions issued to staff during 2010 regarding these changes to the continuous cruising process. 4. the dates and locations of these boat sightings in 2009, and the dates and locations of these boat sightings in 2010. 4. a breakdown of the sightings for each day on each waterway into continuously cruising boats, boats with home moorings, hire/share boats and trading boats. I am writing further to your request for an internal review following our refusal to provide you with the information you requested on 13th October 2010.
initially an oversight on our part, which happened during a change in responsibility for information requests when our previous Information Officer left British Waterways. This was then delayed further following your contact with the Information Commissioners Office because of holidays taken by both my colleagues and myself; I am sincerely sorry for any inconvenience caused by these delays. regarding these changes to the continuous cruising process. 3. A break down the total of 548,218 boat sightings into the figures for 2009 and 2010. For clarity I will address each point in turn below. discussed. As they do not exist I am unable to provide you with any information in response to this request. information unless it is already on record. b. Continuous Cruiser Standard enforcement letters, timeline and file cover sheet. figures for 2009 and 2010.
time, had written to you twice before our final response was made withholding the information. would have believed the information to have been forthcoming. Unfortunately, until the information had been extracted from the database, Mr Gray had not sought any advice from colleagues within the enforcement and legal teams. In attempting to be helpful and keep you updated on the progress of your request Chris had inadvertently given you the impression that you would receive the information in our response. For this I apologise. in our response of 12th October 2010 because the year (2010) was not quite complete at that time. boats, boats with home moorings, hire/share boats and trading boats. forthcoming following the e-mails that you had received from our Information Officer, Chris Gray. “I refer to your e-mail of 13 October and I am writing to let you know that we have considered this matter in detail. 2. BW has not explained why that particular exemption applies. required under the Act to justify withholding the information I requested. I will now respond to each point in turn for clarity. activities. The only other use to which this survey data is put is to determine the levels of evasion nationally on our waterways. boats and trading boats) it would undermine British Waterways’ ability to properly perform its duties if this information were to be supplied and therefore held in the public domain. Furthermore, the information requested would reveal significant levels of detail about our monitoring processes and activities, which could be used to assist people in avoiding our enforcement strategy. 1972, 1975 and 1976. I attach a copy of these bye-laws for your information. houseboats on the canal. It was therefore routine for the canal proprietor to issue licences (on payment of a fee) for pleasure boats and houseboats to be kept and used on the canal. “(8) The services and facilities referred to in subsection (3) of this section include, in the case of the British Waterways Board, the use of any inland waterway owned or managed by them by any ship or boat”. British Waterways is therefore entitled (i) to charge for the use by a ship or a boat of any inland waterway, which is British Waterways owned or managed; and (ii) to make the use of any inland waterway which is British Waterways owned or managed subject to such terms and conditions as it thinks fit. conditional on the permission or licence of British Waterways. references to any right to use or keep any vessel or craft on the waterway or canal”. nature of use for the vessel. failing which remedy various powers are made available to British Waterways. payment for registration and renewal of any houseboat certificate. introduced a system of registration for such vessels, including charging for such registration, but only in respect of “river waterways” which were identified in schedule 1 of the Act, but do not include canals. 32 of the Transport Act 1962 referred to above. powers of British Waterways in this regard. In particular, the 1995 Act introduced a provision that made it a requirement for the issue of any licence that a vessel either (a) has a long term “home” mooring or (b) be used for continuous cruising throughout the period of the licence. Part III of the British Waterways Act 1995 expands on the provisions for registration of houseboats and pleasure craft and a “relevant consent” for the purpose of section 17 is defined as meaning “…a houseboat certificate, a licence or a pleasure boat certificate”, thereby encompassing both houseboats and pleasure craft as originally defined in the 1971 Act. regard specifically to local circumstances, but in the context of the national picture. cruising the waterways. Therefore outside of mooring temporarily in the course of cruising, if no specific mooring permit is granted for a specific boat, the boater will be trespassing on British Waterways’ property. cruisers”. Other people who live permanently on their vessels prefer to generally stay in the same place, which may be on the inland waterway itself or off the inland waterway in a marina or on another stretch of waterway which is not within the jurisdiction of British Waterways. These people will have a home mooring that is also a residential mooring with planning permission. be tempted to moor in the wrong location. rules and regulations and paid the appropriate sums. mooring guidance. I attach a copy of the standard term and conditions. is subject to the grant of a licence and compliance with these terms and conditions. Licensing is a critical element of British Waterways’ funding. At present the cost of maintaining the inland waterways is approximately £140 million per annum. Around £23 million per annum is raised from licence and mooring fees to put towards the cost of maintenance. granted licence conditions would be improper. would prejudice, or be likely to prejudice, the ability of our enforcement staff to undertake their duties. It remains a very real concern for British Waterways that the richness of the data would provide such a clear picture of British Waterways’ monitoring and enforcement activities that the purpose of those activities would be undermined. Furthermore we believe that this prejudice is certain and probable. We therefore contend that the public interest in disclosing the information requested is outweighed by the public interest in non-disclosure. and trust that we have now fully addressed your concerns. I am writing from the Information Commissioner’s Office about the complaint that you have made about British Waterways. I can confirm that I have been allocated this complaint as case officer and have already corresponded with British Waterways in order to ensure that it complied with its obligations in this case. This email has two purposes. The first is to provide an update and the Commissioner’s preliminary view. The second is to provide your options about how this case will continue and ask you to choose one. The main problem that you reported was British Waterways’ failure to conduct an internal review in a reasonable time period and its failure to answer some of your requests at all. I have now told British Waterways what it should have done and it has now issued an appropriate internal review. A copy of that review is attached for your ease of reference. I consider the internal review response accords with what is expected and complies substantively with its obligations under the Act. For your information, British Waterways originally tried to apply section 31 to the information requests in part  and it changed its mind after my involvement. It also ensured that it provided the full figures for both years. § Far too long to conduct its internal review – although there is no statutory timescale to conduct an internal review. I can confirm that I have referred these matters to our enforcement team and they will continue to monitor British Waterways. The enforcement team is concerned about patterns of non-compliance and do not correspond with individual complainants. However, I consider it important that they are aware of these problems to influence their future work. 3. You third option is to elect for a formal decision notice about both the delays and about British Waterways withholding the information under section 31. If so, I would appreciate that you provide your arguments about why you consider that the Decision Notice about similar information is not correct. I would like you to do this to ensure that I address any concerns that you have in the formal decision notice. This option will take more time than the first two. Please choose one of these three options, as soon as possible, and by 20 January 2012. If I do not hear from you by 20 January 2012, I will proceed on the basis that you are prepared to take option one. I hope this letter is clear and helpful. If you have any questions about your case please call me. I can be contacted on the telephone on 01625 545 547. This office is not open between 24 December 2011 and 3 January 2012. This entry was posted on Monday, January 30th, 2012 at 6:43 pm	and is filed under A-Featured Articles, BW Policy News and FOI Act Requests, Continuous Cruisers, News. You can follow any responses to this entry through the RSS 2.0 feed. You can leave a response, or trackback from your own site.